A recognized leader in the Colorado tech community, Moriuchi brings a passion for expanded opportunities for women in technology and a wealth of business development and sales experience to her new position as CEO. 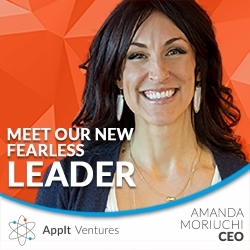 Denver, CO, September 06, 2018 --(PR.com)-- AppIt Ventures, a Denver-based custom software development company that builds cutting-edge, high-quality technology, today announced it has named Amanda Moriuchi as chief executive officer. Moriuchi will assume day-to-day leadership of the company to help continue strong growth. AppIt Ventures is a Denver-based, full-service custom software development company that focuses on achieving their clients’ business goals through thoughtful architecture, design and quality development. AppIt Ventures' strengths are in custom software and mobile app development for small- to medium-sized businesses.